Need a dessert that is just something special? I happen to think this recipe is straight from coconut heaven. It’s everything I love about coconut cream pie PLUS cheesecake, friends. 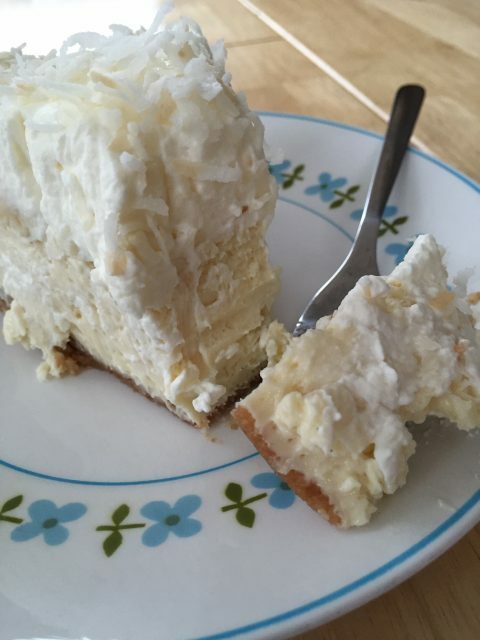 Oh my goodness…I just wish I could describe the creamy, coconut-ty goodness. With a vanilla wafer and coconut crust, a layer of creamy coconut flavored cheesecake, and a coconut whipped cream topping, you are gonna be famous for this one. Crush vanilla wafers in a food processor to make 1 1/2 c. crumbs (should be 30-35 vanilla wafers). and 1/2 c. shredded coconut. Pulse until combined and chopped. Drizzle in 5 T. melted butter and pulse to combine. Press into the bottom and up the sides of a 10″ springform pan. Bake in preheated oven about 10 minutes or until the crust is just set. Remove from the oven and cool. Reduce the oven temp to 325 degrees. and 1 tsp. vanilla bean paste. Mix until combined. Beat 3 eggs, and add one egg or so at a time to the cream cheese mixture. and 1/2 tsp. coconut extract and beat until smooth. Pour the filling into the cooled crust and bake for about an hour or until only an inch or so of the center of the cheesecake is a bit jiggly. Do not remove from the oven. Turn the oven off and open the oven door and allow to cool. Then remove it from the oven and refrigerate overnight. 1 1/2 c. heavy whipping cream to soft peaks. and 1/4 tsp. coconut extract. Then serve this creamy, delicious goodness with your feet up and a smile on, knowing you have just made the world a much more delicious place. *To toast coconut, you can place it in a skillet over medium heat and stir (don’t walk away from it) for just a few minutes until it’s beautifully golden, or spread it on a cookie sheet and bake at 325 degrees for 5-10 minutes, stirring and watching closely to avoid burning. With a vanilla wafer and coconut crust, a layer of creamy coconut flavored cheesecake, and a coconut whipped cream topping, you are gonna be famous for this one. Chop vanilla wafers in a food processor until crumbs. Add in sugar and coconut and pulse until combined. Drizzle in the melted butter and pulse to combine. Press into the bottom and up the sides of a 10" springform pan. Bake 10 minutes or until set. Remove and cool. Combine room temperature cream cheese with sugar, cornstarch, vanilla bean paste, and salt and mix until combined. Beat eggs and pour into cream cheese an egg or so at a time mixing between eggs. Add in coconut milk and coconut extract. Mix until smooth. Pour into cooled crust and bake for about an hour or until all but the center is set. Do not remove from the oven, but turn it off and keep the door open a crack and let the cheesecake cool completely. Refrigerate overnight. To serve, put the whipping cream into a mixing bowl and use the whisk attachment to whip to soft peaks. Fold in the remaining powdered sugar, coconut milk and coconut extract. Spread over the top and then sprinkle with toasted coconut (instructions above). Many thanks to Foods of Our Lives for the scrumptious recipe. My tastebuds are forever in your debt. 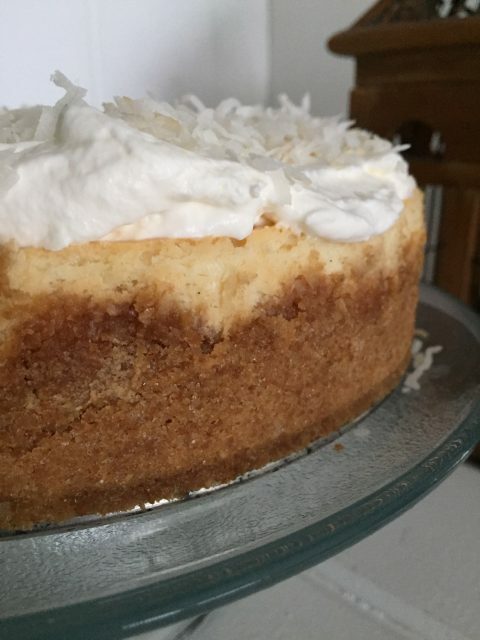 This is my go to Coconut Cheesecake recipe. It is the absolute BEST cheesecake I have ever eaten. 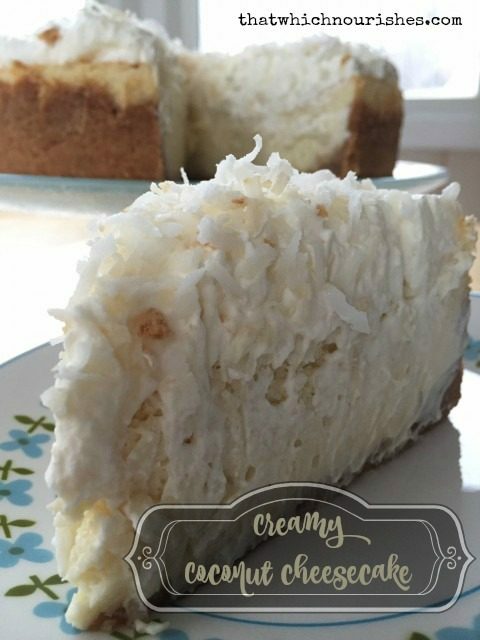 Hubby and I are both coconut lovers and this cheesecake is pure perfection! I love the vanilla wafer crumb crust as I’m not a fan of graham crackers. I actually use this crust recipe for all of my cheesecakes. A quick comment on the heavy whipping cream topping, I have not had any issues with the topping deflating. I think I must get right to that edge before butter because it always stays perfect. Of course the cheesecake doesn’t last more than five days. Well, wasn’t this a happy comment to receive!? 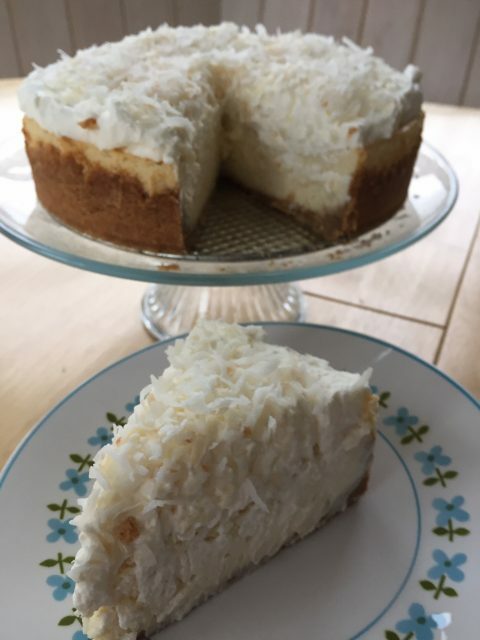 Lynn, thank you so much for taking the time to stop back by and let me know about your love for my Coconut Cheesecake! I so agree about the crust. I think we all feel like graham is our only option and I love playing with ideas for cheesecake crusts. I have a new cheesecake in the works right now. I need to continue to work on a couple details, but follow me on FB and you’ll see when it comes out! Good job on the topping! :o) It’s definitely a fine line to walk with the cream, isn’t it? Thanks again for your kindness. 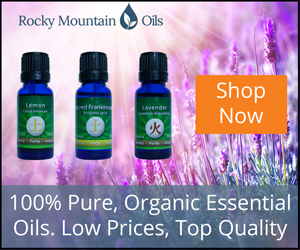 Hope you find lots more to love on my site! We love cheesecake and since this looks so amazing, I’m going to deviate from my old standby cheesecake recipe and make this for my husband’s birthday. I don’t know why but I find that oftentimes my homemade whipped cream has a tendency to break down after a couple days. (I guess since there are no artificial stabilizers in it to keep it fluffy.) Do you have any problems with the whipped cream topping going flat or becoming runny if it takes a few days for the entire cheesecake to be consumed? Yes, I think there are some downsides here and there when we go with more natural food choices and whipped cream can most definitely lose its shape. I don’t remember having leftovers of this and cannot promise either way. There is a fine line when whipping cream (as I’m sure you realize) between stiff peaks and butter, but I do try to ride the line pretty closely because I think too soft is when I’ve gone wrong. I am quite sure I didn’t help anything with this answer, but I’m gonna try to assure you that this cheesecake is worth it even if the whipped cream softens a bit. Just lay it on it’s side on a plate and eat it ugly later. :o) I hope you let me know how it goes! Many thanks for stopping by! This looks amazing! Would you have any tips for making this into individual cheesecakes in a muffin tin? I have yet to invest in another springform pan after my first one leaked on me, but I’m also thinking about making for a baby shower! Oh, Alyssa! What a GREAT idea!! I’m drooling a little thinking about my own little Creamy Coconut Cheesecake right now. :o) I wish I could say I have tried this and give you all the tricks and ideas, but I have not. My secret wish is that you do and that you come back and tell me of your fantastic results and together we have created a genius new recipe. :o) If you try it, please let me know what you think. Many thanks for your comment and idea! I used a cookie scoop to portion the crust into the cupcake liners, so about 2Tbl per. Patted it down with a 1/2 tsp. This yielded 19. But there was extra cheesecake batter… And I filled them to just barely below the top. I think doing 1.5x the crust measurements would be perfect, and then you’d get probably 28-30 individuals! Baked them for 20 minutes, but that seemed too much. Also, I used both foil and regular paper liners… the foil ones were almost all cracked; paper ones all had a smooth domed top. And even though I thought all were overbaked… I tasted one of each after fully cooling in the oven, and the paper liner one seemed to have the perfect creamy silky texture! So I’d check at 18mins next time… But there will definitely be a next time!!! I’m so excited to try one tomorrow once they’re complete!! The crust is ohmygoodness amazing, too! So glad I found your recipe, thank you for sharing!! Bahahaha, deal!! I just did a little perusing, and I will most definitely be making more of your awesome recipes!! 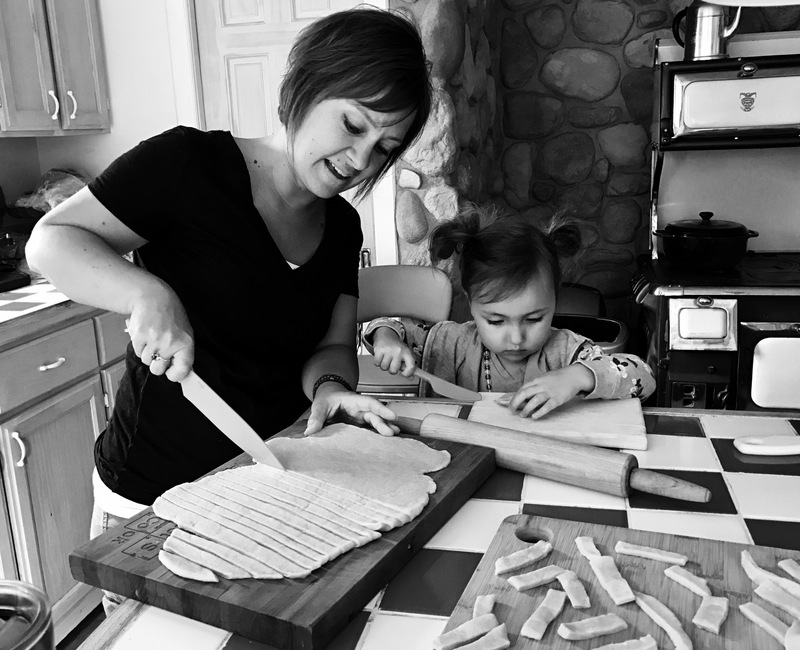 I secretly want a food blog one day, so I love being able to share my two cents from the kitchen adventures! Okay, I had to come back to report the RAVE REVIEWS from everyone at the baby shower!! Followed by more cheesecake requests for future birthdays! I didn’t even get to enjoy one fully composed, they were so loved! Only change I made with the whipped cream was adding 2Tbl more of powdered sugar and a pinch of salt. I seriously cannot get over how awesome they turned out, but I’m so glad! This looks amazing. I’m wondering if you could convert it so it could be done in the Instant Pot? I bet you’d make ALOT of folks really, really happy. It is amazing, Debora! I love good new ideas, but this girl isn’t on the Insta Pot train. 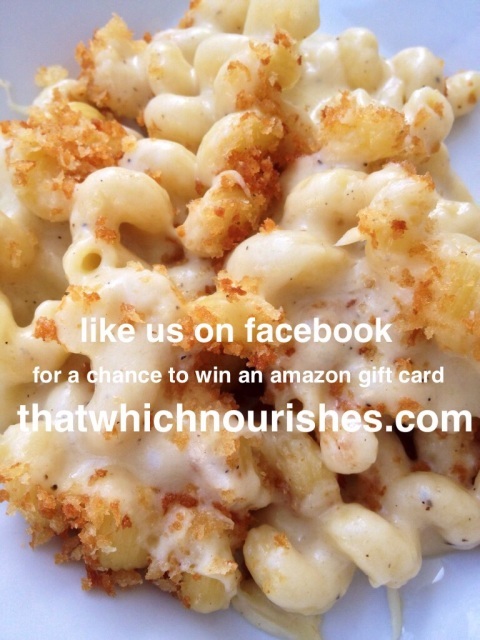 :o) If you are, and you try it, please share! You might get famous. :o) Thanks for stopping by — hope you hang around. Do you cook with or without a water bath? How do you make the vanilla bean paste? There are many types of coconut milk on the market today, which one does this recipe refer too?